… or more simply Cheese Bread, as it’s actually called in Jeffrey Hamelman’s Bread: A Baker’s Book of Techniques and Recipes This is bread #21 in the Mellow Baker’s Challenge to get through all 84 recipes in the First Edition book. Yes, we’re now at about the 1/4 mark. If you have the book and want to give it a go, it can be found on page 180 from the Levain section (page 190 of the 2nd Edition). Those of you following along here and on MellowBakers.com will notice that this is in fact a September bread and I’m posting it in mid-October. The reason for the tardiness is that there’s been a refocus in our household of late that’s been taking all our attention; more on that later. I chose a good Italian Parmigiano Reggiano cheese as the bread’s final flavour can only improve with the quality of cheese you use. The dry Kraft pre-grated stuff would not be a good choice here. An alternative, to save a bit of money, would be to mix the Parmigiano with some Asiago or whatever grateable “dry” cheese you prefer. Here it is, the final bread in Peter Reinhart’s The Bread Baker’s Apprentice and also the last bread in the BBA Challenge which began back in May of 2009. Is it really almost a year ago? Wow. Well, about 43 weeks in all since the idea was to make one bread every week and this is bread #43. Granted, I did NOT make every single recipe, a few were for certain not going to be enjoyed in our household and it was better to skip than to throw away a partially eaten loaf. 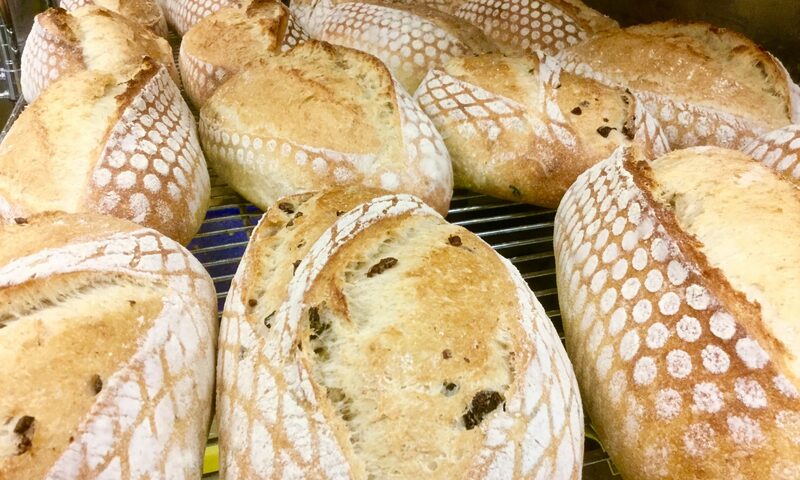 Still, the bulk of them were done and we’ve found some nice breads as well as a couple of duds we’ll not be getting back to. None the less, we’re now looking at making another cheesy bread, this time a three day extravaganza, according to the book. Day one: mix the sourdough sponge and allow to proof for 8 hours. The mixing part took about 4 minutes so this isn’t exactly a difficult or time consuming step. The sponge is basically just sourdough starter, water and flour. I made this up very early in the morning and had it proofed 8 hours later that day. Here the recipe says to chill it until tomorrow, then let it sit an hour to warm back up. I decided to skip that chilling part since the dough was going to again chill overnight in the final proof stage so flavour development would still occur while I shaved a day off the full run. Since this is a heavily cheesed and onioned loaf, I don’t think the dough flavour will suffer. So later that same day, I’ve got my ingredients ready and I’m heading into step two, mixing the dough and bulk proofing. Day two is supposed to be preparing the roasted onions then mixing the dough and refrigerating overnight. Day three is finishing the loaf’s toppings, final proofing and baking in the hearth oven. Here we are at the 42nd recipe in Peter Reinhart’s The Bread Baker’s Apprentice with only one more to go in the BBA Challenge. This is, I’m hoping, a good counterbalance to the previous White Bread that was a bit lackluster and will help to close up the Challenge with a bit of a bang. This recipe, as well as the next and final one, is a cheese laden bread and looks to have definite character. This is not bread for peanut butter and jam sandwiches – well, maybe it is – but will decidedly want to be paired with more robust spreads and topping such as deli meats or served with a stew. This is an enriched bread and takes only one day to make, as long as you’ve got your sourdough starter ready. I fed my starter early in the morning and, using the excess, built up the required 300g in one go; it was ready to go in just a couple of hours. Here we are at bread No. 34 in The Bread Baker’s Apprentice, Sourdough Pumpernickel. The header image is the same as the prevous entry since it features both the lighter New York Deli and the Pumpernickel breads. These are what we should be hoping to see once we’re done baking. This was a pretty simple bread, all in all, nothing terribly tricky or fancy to do, the most unusual thing here is the use of cocoa powder to boost the dark colour of the bread. Otherwise, there’s nothing in the process we haven’t already done many times. So let’s have a go at this 10th-to-last recipe in this BBA Challenge. Recipe number two in the The Bread Baker’s Apprentice Challenge series is “Artos: Greek Celebration Breads“. In the preamble, Peter Reinhart tells how this is a holiday and festival bread that cover multiple variations. The basic recipe is easily turned into “Christpsomos”, a Christmas loaf, by the simple additions of raisins, cranberries and walnuts or into “Lambropsomo”, an Easter loaf, by adding raisins, dried apricots and almond slivers a, braiding and nestling red-dyed hard boiled eggs. 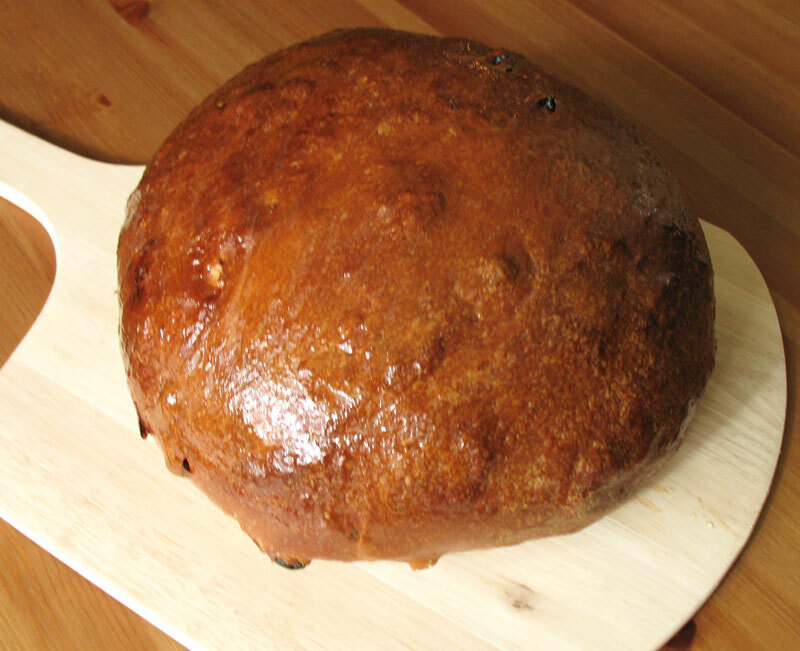 There are numerous local and not-so-local variations on this basic spiced bread. I went with the christopsomos version since I did happen to have raising and cranberries, although I passed on the walnuts since we’re not big fans here.